Nast’s final shot before the 1872 president election on November 5 was “‘The Pirates,’ Under False Colors” (dated November 9, published October 30). It presents the Greeley coalition of Liberal Republicans and Democrats as pirates futilely attempting to overtake the Republican Ship of State, which flies the Stars and Stripes upon which is written “U.S. 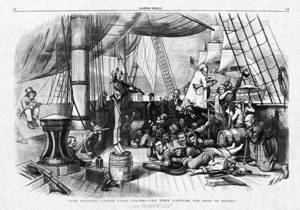 Grant.” The stealthy crew of partisan cutthroats lies low prior to making their move, while the vessel appears to be under the nominal direction of candidate Greeley, standing atop something on the right with his “N. Y. Tribune” speaking-trumpet and “What I Know About Shifting” booklet. First-mate Whitelaw Reid plays a violin, labeled “This Is Not An Organ,” as he stands tiptoe atop a barrel of “Gun Powder Newspaper Lies,” which seem likely to explode (note the smoke at its base). The “False Colors” of the title are listed on the sail over Reid’s violin: “Journalism,” “Love,” “Peace,” “Reconciliation,” “Christianity,” and “Reform.” Nast’s composition is a faithful and witty parody of “Le Bateau Pirate” (1851), a painting by the French artist François Auguste Biard.